The Old City parish Church of SS. 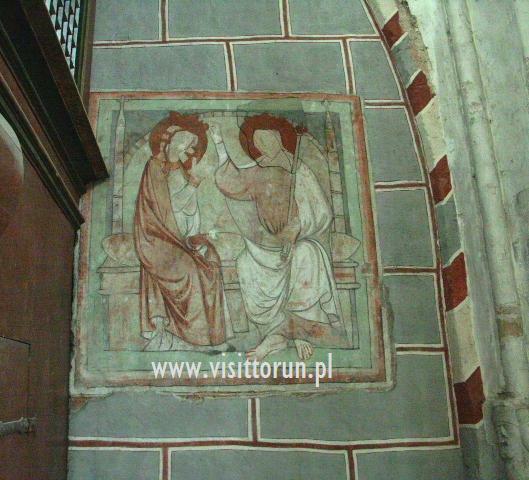 John the Baptist and John the Evangelist (Polish: Katedra Św. Jana Chrzciciela i Jana Ewangelisty or in short: Katedra Świętojańska) is one of the oldest churches of the former Teutonic state, a monument to Toruń’s greatest glory and a mine of art objects. 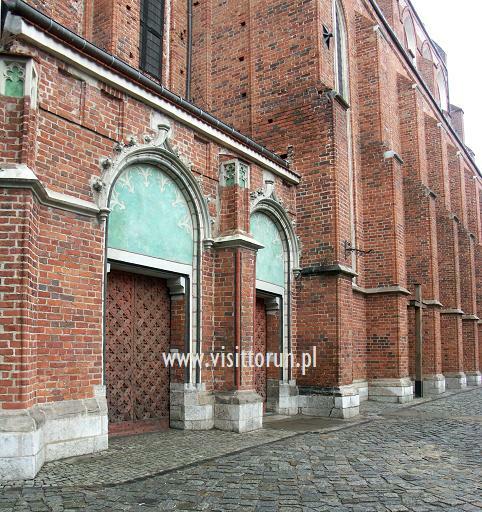 It is one of the biggest churches in Poland. The construction work, which lasted for 200 years, was initiated in the mid-13th century, yet the church was given its present form – a high three-aisle hall with side chapels and porches - in the mid-15th century. Inside, the groin and stellar vaults support the 27-meter-high ceiling. 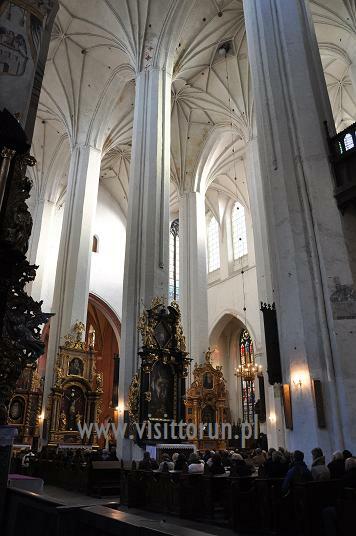 Interiors sightseeing: the church is in religious use thus the visit is possible outside the mass hours only. Usually it's open for visitors in the high season (April-October) every day from 8.30am till 7.30pm and from 4.30pm till 7.30pm on Sundays and holidays. 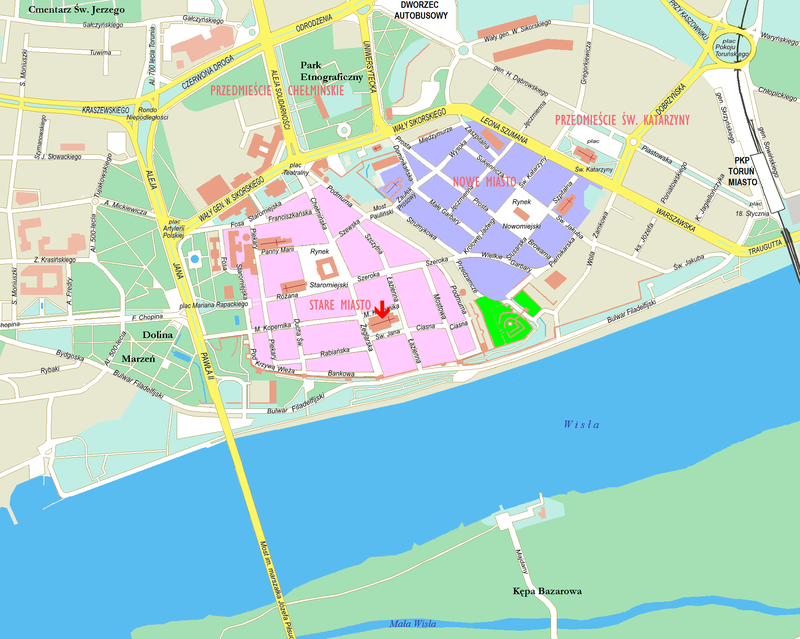 Until the Polish-Teutonic Second Peace of Toruń in 1466, the church was under the patronage of the Teutonic Order. Then, up to 1501, it enjoyed the patronage of the Polish King and, finally, that of the city. In 1530-83, the building was used for Protestant worship, while later both the Protestant and Roman Catholic services were held there. Since 1596, the church has been in the hands of Catholics again. 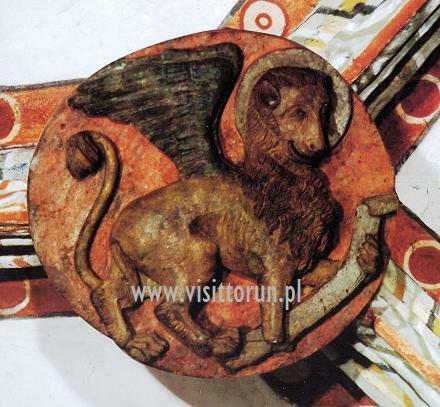 Of historic interest in the cathedral are Copernicus-related memorabilia (>>). The belfry houses Tuba Dei (>>) – the largest medieval bell in Poland, cast in 1500 (7,5 ton heavy, 2 metres high, 2,27 metres in diameter), and outside, facing the Vistula, Digitus Dei, the so-called rafter’s clock, with one hand. 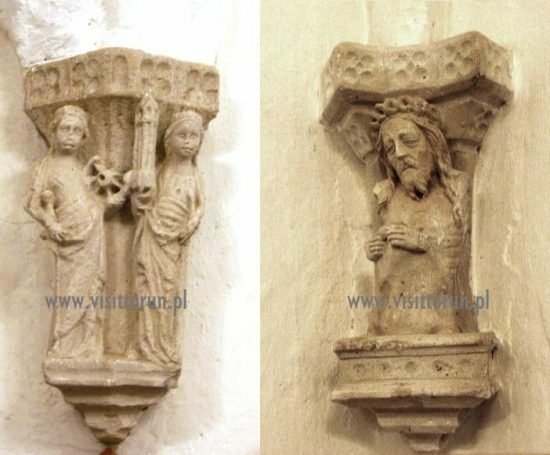 In the church, there are a number of valuable elements of the interior furnishings, many of which have survived due to the patronage of the local patriciate and nobility lasting for a few hundred years. The Old City parish church was at the centre of their world. They protected it throughout their lives and formed brotherhoods centred around it only to be granted the privilege of being buried in the crypt or to be remembered by the next generations through epitaphs or plaques. In the aisles, there are chapels founded by guilds and brotherhoods. We start exploring the inside of the church in the south aisle. The first chapel, known as Copernican Chapel (or the Guardian Angels Chapel), is one of the most interesting parts of the cathedral. It houses Nicolaus Copernicus’s memorabilia, such as the early Gothic baptismal font where he was baptised; a marble bust dating from 1766, which is the oldest monument to the astronomer; a commemorative plaque over the bust bearing an epitaph, dating from approximately 1580. 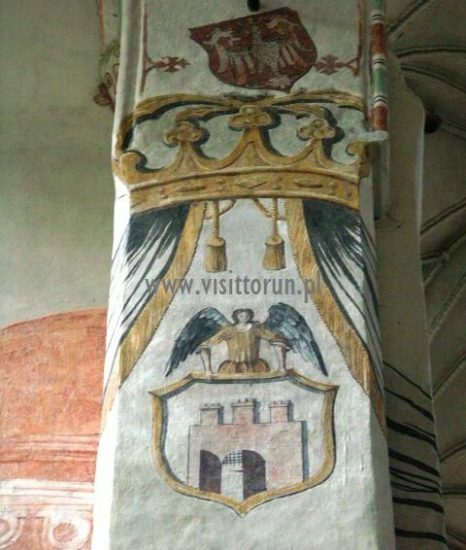 The top of the plaque is framed with the semicircular portrait of Polish King John I Albert, who died in the Royal Hall of the Old City Town Hall in Toruń in 1501. Legend has it that the King’s heart was laid down in the wall below. In the chapel, the Mannerist altar with the Gothic bas-relief of the Dormition of the Blessed Virgin Mary, dating from approximately 1500, is also worth examining. Heading for the presbytery, we pass other chapels, epitaphs and coffin portraits, which by no means can be thoroughly described in the present guide. In the next chapel, one can find, for example, an altar with the Baroque painting of the Visitation, as well as early 18th-century Baroque paintings modelled on the Italian painting. In the wainscot, a painting depicting the visit of Jesuit Gwido Tachard and the baptised people of Siam to Pope Innocent XI in 1688. Near the first pillar from the presbytery, there is a Baroque altar featuring the Gothic bas-relief depicting the scene of Mary Magdalene being raised by angels. Nearby, in the second chapel from the presbytery, there is, for example, an altar made in 1719 with a painting by Bartholomäus Strobel, an eminent Baroque painter working in Toruń since 1638. The painting, dating back to 1634, depicts Mother of God entrusting Infant Jesus to St. Stanisław Kostka. A number of valuable works of art can be found in the presbytery, including the late Gothic triptych of St. Wolfgang, dating from the early 16th century, and over the triptych, the early 14th-century Gothic cross. 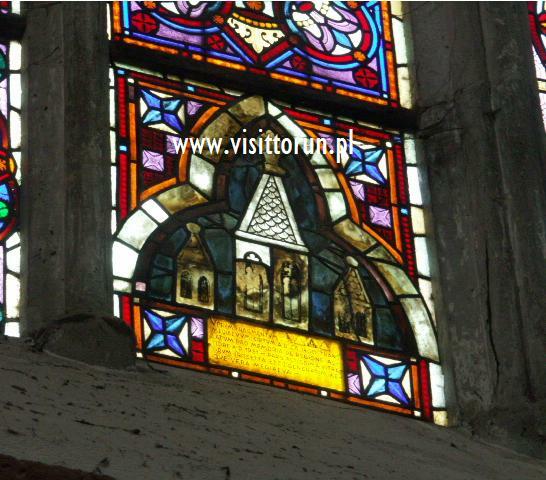 Behind the altar is a Gothic-style stained-glass window, comprising authentic elements in its upper, pointed part. The altar is flanked by two large paintings of the patrons of the church, dating back to 1330-60. The largest painting, however, is the excellent Gothic polychrome over the sacristy entrance, dating from approximately 1380. 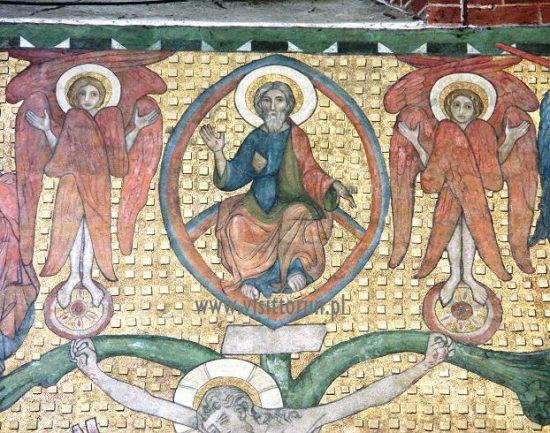 It depicts the Crucifixion and the Last Judgement (>>). On the opposite wall of the presbytery, there is the tombstone of Burgomaster Johann of Soest and his wife Margarete. Made in a workshop in Brughes in approximately 1360, the plaque (carved brass) is an outstanding example of medieval art. 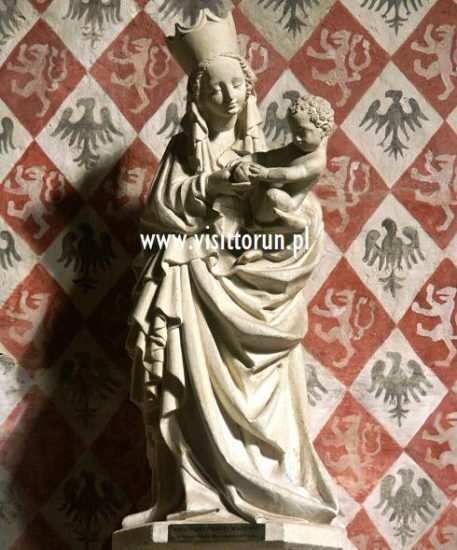 In the north aisle, on the polychrome wall adjoining the presbytery, there is a Gothic stone console with the bust of Moses, on which a replica of Beautiful Madonna of Toruń is situated. The previous statue, made at the turn of the fifteenth century, disappeared in 1944. 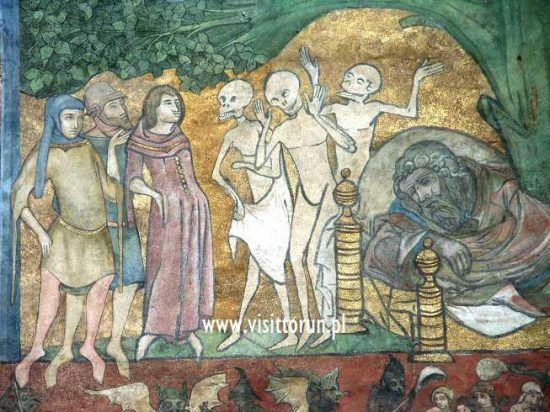 This priceless Gothic masterpiece of high artistic standard on a world scale was an outstanding example of Toruń’s sculpture. The Chapel of the Holy Sacrament in the north aisle, the first from the presbytery, houses a mid-eighteenth century Rococo altar with the painting of the Last Supper, among other things. 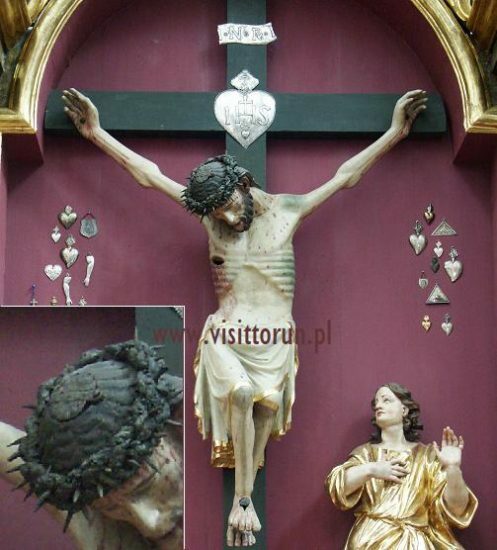 On the tabernacle is the Gothic figure of Christ of Sorrows, dating from the first half of the fifteenth century. Other chapels contain Baroque and Rococo altars, epitaphs and polychrome murals dating to the Gothic period or later times. Especially interesting is the chapel of St. Barbara (founded by the Brotherhood of Skippers) near the porch, in which one can find the altar and paintings of the patron, the votive painting depicting Christ preaching in a boat and the mid-fifteenth century Gothic sculpture of Ecce Homo between the windows. In the floor, there is the Gothic tombstone of Berthold Segeborth of Lübeck. Mediaeval Digitus Dei (God's Finger) clock on the Cathedral's tower. 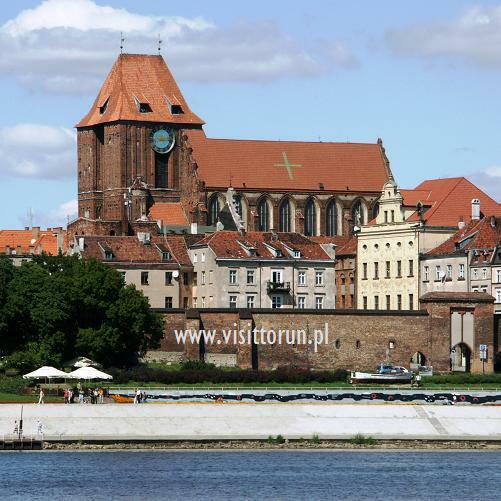 The Beautiful Madonna of Toruń. 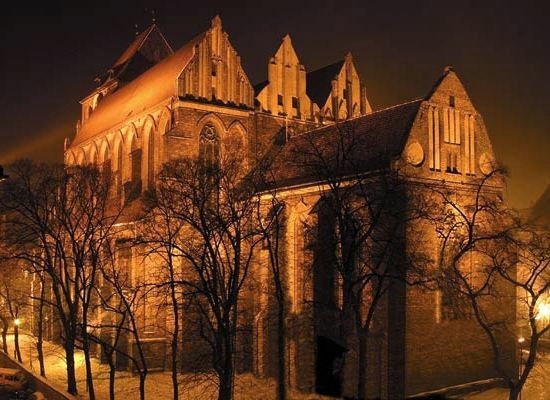 This priceless Gothic masterpiece of high artistic standard on a world scale was an outstanding example of Toruń's sculpture. 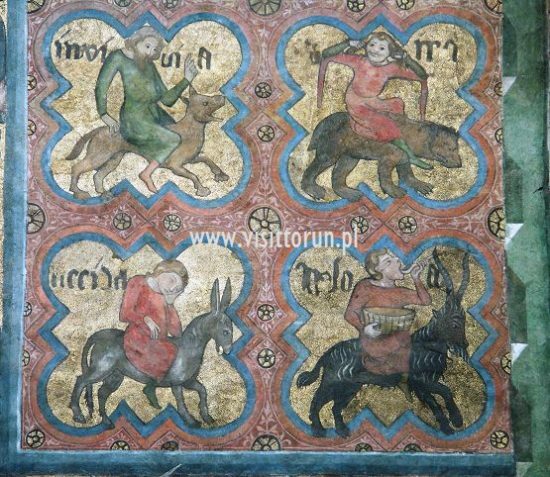 This unusual mural in the cathedral’s presbytery is a precious medieval work of art, made around 1380. The 6.40 x 5.10 metre (21 x 17 feet) painting is divided into the heavenly, earthly and infernal scenes. Its central point is the scene of the Crucifixion of Christ on the Tree of Life rooted in the side of Jesse, the ancestor of Christ. Under the Tree there are, among others, Mother of God supported by two women and St. John the Evangelist and Longinus in marvellous armour on the right. Next to Jesse’s bed, the scene of the meeting of three living persons with three dead ones, in which the dead warn the living against sinful life. At the top there is the heavenly scene: in the centre, God the Father is sitting on the throne, encircled by angels announcing the Final Judgement; on the right St. Peter with the key to Heaven’s Gate is leading the redeemed through the gate; on the left, St. Gabriel the Archangel with a sword is driving out the fallen souls from the Paradise. 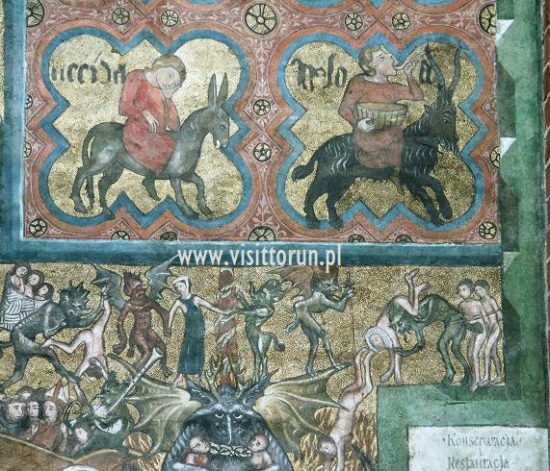 The bottom part presents a suggestive imagery of hell with a wide variety of punishments awaiting sinners, regardless of their position and social status on earth.